January has always been known as one of great decorative meetings. Firstly, we have the long-awaited Maison&Objet showroom, which has brought all the professional deco-sphere in Europe to Villepinte, following in the quirky footsteps of the capital itself. 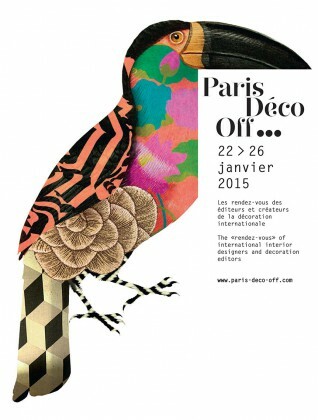 From 22nd to 26th January, around one hundred material experts and designs set themselves up in this showroom. Here is a chance to discover collections of textiles, furniture, wallpaper, light installations across settings, all of which honour the toucan this year. The range of backdrops expands the left bank with the rue de Seine as a new focus. Here are the must-sees of this 2015 edition: the return to roots with Elitis with a new collection entitled “the spirit of Elitis”, comprising of mural surfaces, wallpaper and materials that emphasise good-humour and imaginative work, with porcelains and wallpaper by De Gournay, precious carpets by Codimat Co-Design, the graphic furnishings of Bruno Moinard…a jury will select the most beautiful window display. And for those busy bees, a nocturnal opening is scheduled for Saturday 24th January, until 11pm.